Out of the five or six people who read this blog, this entry will be of interest to maybe 2.5 of them. That means one person is either only half interested, or very, very short. Rachel Zoe, plucked from her real life as celebrity stylist, reduced to mere pixels, and not looking much like herself anymore, moved into a new home, sight-unseen. Her first order of business? Move right the hell back out. That's right, sweetie - this place isn't even big enough for your shoes. Her first reaction upon seeing her new abode. 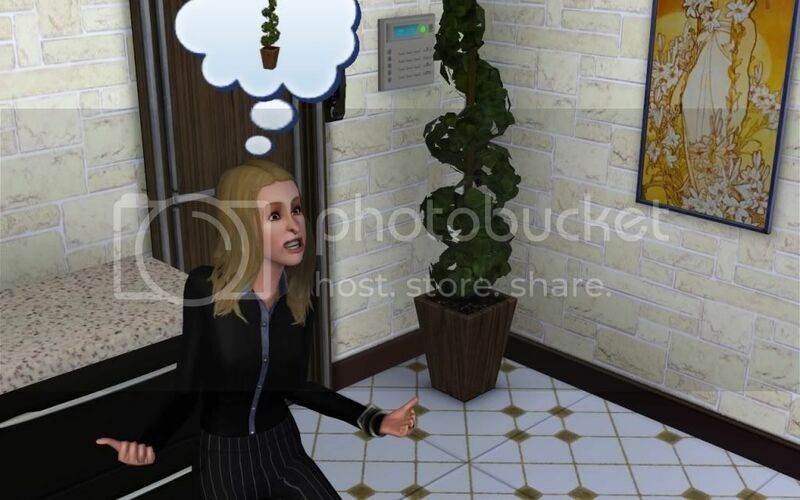 I don't know what she feels about that plant, but she feels something. After having a few more feelings about random items in her house, each as inexplicable as the last, she gets herself an entry level position in the "business" profession, bringing coffee to the higher-up. Can she even touch coffee that wasn't born through the hands of a Starbucks barista? Only time will tell. 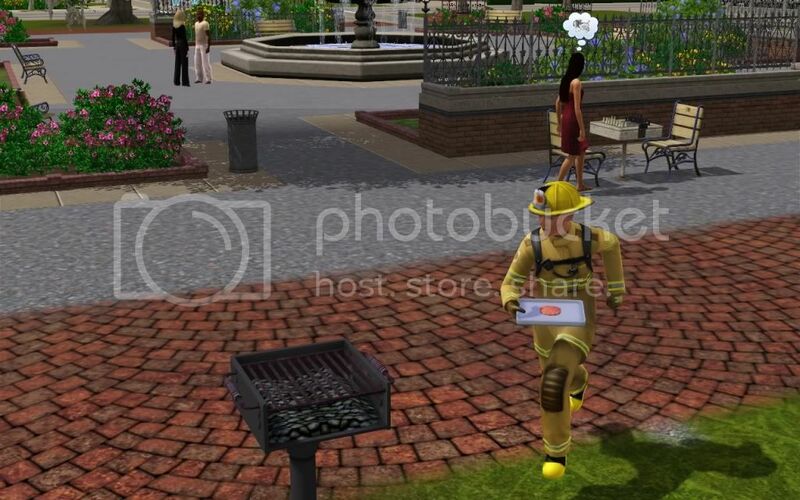 In the meantime, Rachel heads into the park at the center of town for the neighborhood Grill-A-Thon to see if she can't find someone to impregnate her. What else is there to do on a Sunday? Apparently, there's some sort of raw hamburger emergency going on here. Rachel scuttles over to check the situation out. I want a like button! I'm the very very short one! What else IS there to do on a Sunday? Great start! If you follow my blog, I'd definitely be inclined to add you to my list of special short people. My word, you're funny. Ten points and a cookie for you. That works out great, because I love cookies. Oh yes I definitely followed your blog. And I've definitely added you to my list of special short people. OMG I am going to looooooove reading this! THumbs up!! Thank you, FunkyFairy! Glad you're here, I'd be happy to waste your time with my blog. Tell your friends! Click a button! Sure, FunkFairy. Hey, did you mean to follow The Story instead of this blog? 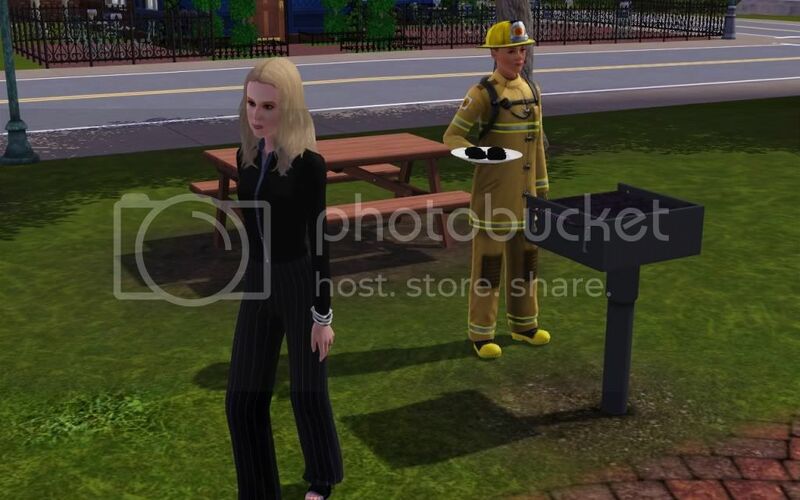 That blog (The Story) isn't the one for my Sims legacy, etc. That's actually a story I started writing with a couple of friends, but we're not adding any new content anymore. This blog is called Grievances. I meant to follow both, I am new to this though so I am still tryna learn the ropes. I am an aspiring author with no inspiration at the moment.I am looking for a muse I liked the first post of "The Story" SO I thought I would follow it to access it more easily. Aha. Well, if you read The Story, prepare for it to get extremely weird. There were three different authors, with two guest authors, one of whom is my husband. Weird? YUSSSSS! Weird is my middle name. Wanna hear something potentially embarrassing?